At Samoan Highland Hideaway you have the WHOLE house to yourselves with maximum comfort, privacy and the full functionality of your own home. Not even to mention produce from the plantation. This executive home is beautifully appointed, completely enclosed and fully furnished. We are semi-off-grid with solar power (battery and mains back-up), rainwater tanks, and our own plantation. Mango, banana, papaya and avocado are a few pleasures awaiting you. The main split level house has four bedrooms, three full bathrooms, modern and fully equipped kitchen, 60’ long verandah opening on to a dream deck overlooking the private valley. This house is ideal for family and especially numerous couples. The Main Dwelling: This split level home is set on a reasonably steep incline facing the northwest looking out over a small private valley. A beautiful modern kitchen opening onto the lounge room is surrounded by an enormous enclosed L-shaped verandah. Also upstairs we have the master bedroom adjoined by a full ensuite, another bedroom, full-size bathroom and laundry. Downstairs consists of 2 more large bedrooms, another full bathroom and spacious office adjoined by a reading room. The verandah opens onto a new deck that gives you the impression of being on top of a mountain. You will love to experience the brilliance of the moon in its fullness and the wonderful evening breezes; not to mention our local coffee in the early morning. Serenity, extreme quiet, very secure and insect proof. Aternative Traditional Samoan Fale: Our new but traditional Samoan Fale (home) will enable you to experience all the uniqueness of this very old Samoan design especially extremely effective ventilation. The ancient design has been unique only to the Samoan Islands. The oval shape is covered with by an extremely high and domed roof enhancing the fale's coolness. The interior is intricately hand finished with local materials bathing you in timeless Samoan tradition. Tim and Maria Walkden-Brown are now seeing their vision of providing a place for travelers to appreciate serenity and quietness in a beautiful and uncomplicated hideaway come true. Why, because that is what we ourselves seek…. how much more for us to be share it with like-minded soles….. the Samoan Highland Hideaway. Our quest seeded in the early 1970’s when Tim arrived in Samoa from Australia on his way to Canada. He met his wife Maria and now 38 years later after sojourns in and between Samoa, Canada, Australia and New Zealand we are entering into our dream. No wonder the iconic writer Robert Louis Stevenson had a similar dream. Our family is settled in Australia and Canada and sometimes Bosnia but they all adore the purity of the beauty, culture and simplicity of Samoa. So can you. Tim has spent a lifetime in heavy engineering in many remote locations from the Canadian Arctic to the windswept Sub-Antarctic. Maria’s time away from Samoa saw her putting her heart into what she loves; serving people. She had the ongoing privilege of working alongside people from Africa and Asia while meeting premiers and Canadian hockey stars. Above all she loves her garden so where better than Samoa. As you can see we are a multicultural family, love meeting like-minded folk from all countries. We built our present house in this beautiful and quietly remote highland region of Aleisa on the cross island road to Paradise Beach in the early 2000’s. Since then the grounds have developed and much of our sustenance matured. We completed building a traditional Samoan fale adjacent to the main house in 2010. We can’t wait to share this with our guests. 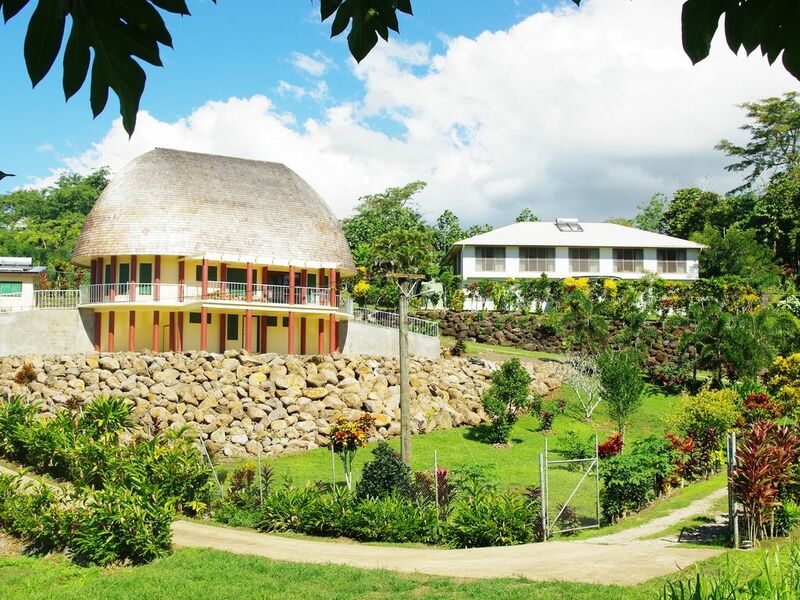 Located in the Samoan highlands above the capital city Apia away from the tourist traffic and business of city life. We originally chose this remote and wild piece of land because it was distant for everyday Samoa. It has transformed to what you see today. We developed the land for our retirement home and then it took on the expansion into our present vacation property. Ensuite includes: - large tiled shower recess - separate toilet with transluscent louvers - large his and hers open closets Bathroom #2 has large tiled shower recess and is just across the hallway from Bedroom #2 on main level Bathroom #3 is downstairs and is shared by the double room and twin share. Located on the hill of a lush valley, overlooking our private plantations and tropical gardens. We grow pineapples, papayas, coconuts, bananas, and more! Main house: 2100 sq ft upstairs and 900 sq ft downstairs. Samoan Fale: The Fale is alternate accommodation with master ensuite, 2 single bedrooms, & a loft sleeping 3 singles. 2 1/2 bathrooms. The Fale is 1300 sq ft and fully self contained as is the main house. 7 people would be very comfortable here. Loved the kindness of the people. John was great! It’s hard to find a place big enough to House 10 adults. There were beds for only 9 so one had to sleep on the floor and the downstairs beds were small. It’s a very nice home and we adjusted well and had a great time. We loved sitting out on the large balcony in the cool of the evening a gazing at the glorious stars. We especially enjoyed the fresh fruit from the plantation tha John brought us. Our large family group just came home from staying at this amazing property in Samoa. It is just minutes from downtown Apia and is nestled in the hills just above making it about 10 degrees cooler than staying in town. It was clean, well appointed and Tim and Maria are the most enchanting hosts. We felt so pampered with daily visits to check up on us, deliver fresh produce from their garden and a wonderful woman who tidied up for us. It was magical! We watched the glorious sunrise and sunset on the balcony- where we also did daily Yoga ( they even had mats for us!). We will definitely return again and cannot recommend this place high enough! Thank you so much for the most glowing review Angela, Vince, Jim and family We felt that you were part of our family and look forward to your visit with us again. We appreciate having lovely guests such as yourselves, you are a credit to the industry. Maria also enjoyed your visit very much. We would love to have you again. My family had a great stay in this beautiful, well kept home - we like to thank our host Maria who made sure we were all comfortable & safe - always made sure any amenities that was needed eg extra fan, rice cooker, Maria would attend to straight away - she would drop whatever she is doing to do this. Maria was always helpful and a pleasure to chat to. It was good to have a dryer (main house) and Maria did not mind when you would use it (day or night) - loved the solar system invested in both properties and the house was very spacious ( we had 7 adults and 4 kids ). Thank you Tim & Maria - we have recommended this home to friends & family and hopefully when we return again would definitely stay here. Thank you so much for your lovely review. Yes Maria is a great people person. Look forward to seeing you again. A small price for comfort. Tucked away in Aleisa, we were greeted by the lovely Maria (owner). Clean Home which contains everything you need and more. A plantation of pineapples, pawpaw, avocado and bananas we had access too. Internet reception wasnt great but plenty of books to read. A safe place with friendly night security and grounds maintenance team. Glad you loved the home. Yes Maria would make you feel welcome. WOW! Better then the photos. On arrival, we were greeted by Lena & Tepora who were both very welcoming. All the amenities were up to standard and the up keep of the gardens were amazing! The location was perfect and suited our needs, very private and well away from the main road. BUT, as the owners have mentioned, make note that the shared drive-way is very rocky and you will be best to have a 4WD or similar .We all enjoyed our stay very much and would definitely recommend this property to small & large families. Thank you to the ladies Lena & Tepora for the great hospitality. We hope to see you again on our next trip. Thank you so much for the tremendous review. Tepora and Lena will be most appreciative. The ideal Vacation Home waiting for you in the highlands above Apia nestled on 2 1/4 acres with your own private little valley where delightful tropical breezes will relax you in the cool of the evening. We are in a quiet and secure isolation yet within a short drive of Apia, Faleolo International Airport, Paradise Beach, Cloud Nine Resort and many other fabulous attractions. For your convenience additional services are available from our onsite staff such as: cleaning, cooking, island tours, shopping. Inquire for further information. Golf: Faleata Golf Course boasts 18 holes underneath the beautiful backdrop of the Samoan highlands. The restaurant and bar are wonderful for an evening out being so close to the Samoan Highland Hideaway.